Blog Engage is by far one of my favorite blogging communities. Since I joined 2 years ago, I've come in contact with the best world class bloggers in my niche and made some powerful connections. First and foremost, Brian from Blog Engage is one heck of a fellow who is always there to support the community and offer a helping hand to new bloggers and seasoned veterans like myself as well. I've also been able to connect with a wide variety of wonderful people who have ended up guest posting on my blog Basic Blog Tips. So if you're looking for guest bloggers, let me tell you - Blog Engage is a great place to start. For example, here's a list of Blog Engage members, that I'm extremely proud to say, have written some fantastic articles on Basic Blog Tips! There's one more person I met on Blog Engage that I need to add to this list, and although he hasn't done a guest post on my blog, he has helped me behind the scenes in more ways than anyone can imagine and his name is Hesham Zebida from Famous Bloggers. He is also the brilliant mind behind the ThesisAwesome Blogskin that I use on Basic Blog Tips. I signed up for the Blog Engage RSS Service at the Platinum level when it was first introduced by Brian and I simply love it. The reason I recommend the RSS Service is because anyone signed up for the platinum service can add three blog feeds to their account. That's perfect for me because I have so many blogs. This is also a big time saver for all of my guest bloggers as well. Some of them have multiple posts on my blog and as you can see from the list, they have their own blogs too. With the RSS service, they never have to worry about going through the process of manually submitting their posts to be promoted within the Blog Engage community. The more blogs you have, well that's just all the more reason to use the Blog Engage RSS Service! Even if you are a regular guest blogger on someone's blog and they don't belong to Blog Engage, you can submit the feed for your guest posts to your service. If you're not sure how to find the feed for your guest posts, here's the tip I included in an article I wrote on Blog Engage called Be Good To Your Guest Bloggers and They'll be Good To You! 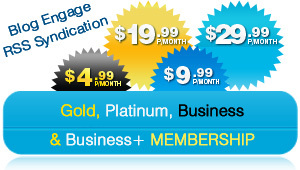 The Business PLUS Membership comes with Free Blog Engage Accounts (up to 5) (29.99 Value Each, 150 USD Value Total). (Great for Contest Giveaways , Multi Author Blogs, or SEO Companies with Blog Clients). You also get 1 Giveaway where we allow you to offer one free year subscription of our gold service to any member by hosting a contest on your blog. We will also help you market and promote this contest driving traffic and new readers. Every month your blog will be spotlighted on our community blog and featured on the Blog Engage home page and upcoming pages. This is where we get the highest volume of traffic. These features can be about your blog, contests you're in or throwing or events you need help marketing and promoting. Let us help build your online brand. Head over to Blog Engage to get more details and find the level of service that is right for you.